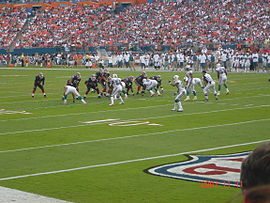 The 2007 Miami Dolphins season was the 38th season for the team in the National Football League and 42nd season overall. The team nearly went winless for the season, but on December 16, the third to last game of the regular season, they beat the Baltimore Ravens, giving them a final record of 1–15. The Detroit Lions became the first team to go 0–16 the following season. Their only win of the season gave them the first pick in the 2008 NFL draft. They also failed to improve upon a 6–10 season in 2006. Under former head coach Nick Saban in a year that began with high hopes, Saban resigned from the Dolphins to become the head coach at the University of Alabama, after repeatedly saying he would stay with the Dolphins. The Dolphins entered 2007 in the process of rebuilding under new head coach Cam Cameron, the former offensive coordinator for the San Diego Chargers. The coaching staff underwent significant changes, with approximately twelve[clarification needed] coaches newly hired or reassigned. Cameron also made various changes to the team's roster, with more than a dozen players being added or re-signed and just as many being released, traded or allowed to sign elsewhere. Six of the team's losses in 2007 were by margins of three points or less. Since the 1970 AFL-NFL Merger and the league's expansion to 16 games in 1978, the 2007 Dolphins are the nearest team to have gone winless. During the 2006 season, rumors persisted of then-Dolphins head coach Nick Saban leaving for the University of Alabama at the end of the season. Saban denied these rumors throughout the season, to the point where on December 21 he told the South Florida media "I'm not going to be the Alabama coach." Whether or not he meant it at the time is unknown, but Saban's stance softened after the season, and on January 3, 2007 Saban resigned from the Dolphins to become the new head coach of the Alabama Crimson Tide. On February 2, 2007, NFL commissioner Roger Goodell announced that the Dolphins and New York Giants would play a game at London, England's Wembley Stadium. The game —- the second regular season NFL game to take place outside of the United States and first to take place outside of North America -— counted as a home game for the Dolphins. It took place Sunday, October 28 (Week 8) with kick off at 1:00 pm ET (5:00 pm local London time). It was broadcast on Fox. The Dolphins lost the game to the Giants by a score of 13���10. In the 72 hours following the announcement, over half a million ticket requests were received. On May 17, 40,000 tickets were made available to people randomly selected from the initial requests. The tickets sold in 90 minutes. On March 2, the Denver Broncos acquired defensive tackle Dan Wilkinson from the Dolphins in exchange for a sixth-round draft choice in the 2007 NFL Draft. A condition of the trade was that Wilkinson report to the Broncos for a physical by Friday, March 16. He did not report for the physical, and although neither team was able to reach Wilkinson by phone the deadline for him to report was extended in hopes of eventually closing the deal. On March 29, the deal between the Broncos and Dolphins was finally voided. The sixth-round pick reverted to the Broncos, and Wilkinson's rights were once again held by the Dolphins. After failing to attend offseason workouts with the Dolphins in the months that followed, the Dolphins finally terminated Wilkinson's contract on June 18. After five seasons as AFC North rivals, former Pittsburgh Steelers linebacker Joey Porter (who had signed with the Dolphins earlier in the offseason) and Cincinnati Bengals offensive tackle Levi Jones were involved in an altercation in a Las Vegas casino on March 18. In the early morning of 2007-06-23, 23-year-old Dolphins defensive tackle Fred Evans was arrested in Miami Beach. According to the police report, Evans was in a dispute with a taxi driver, and refused to leave the cab at the request of the officers called to the scene. Evans reportedly engaged in a physical struggle with the officers when they tried to handcuff him, with one officer being bitten on his left wrist. The officers then used tasers to subdue Evans. He was charged with battery on a police officer, disorderly conduct, resisting arrest and trespassing. Complicating matters could be the fact that Evans is already on probation in Colorado County, Texas for possession of marijuana. In a team-released statement, Dolphins head coach Cam Cameron said: "We are aware that Fred Evans was arrested this morning. We will not condone this type of behavior. I assure everyone it will be dealt with seriously". Cameron made good on his word a few days later, as Evans was waived by the team on June 28. Re-signed by the Dolphins in March after spending 2006 training camp with the team, wide receiver Kelly Campbell had his contract terminated on July 6. It was not until July 24, however, that it was revealed that Campbell's release stemmed from an arrest on drug charges in Atlanta, Georgia on July 3. Campbell was charged with felony possession of marijuana and Ecstasy and a misdemeanor charge of providing false information to police officers. It was Campbell's second arrest in Fulton County. In 2005, Campbell was arrested and charged with marijuana possession and theft by receiving stolen property involving a handgun. He reached a plea deal to avoid a trial. On the morning of Saturday, July 14, Pro Bowl wide receiver Chris Chambers was arrested in Charlotte, North Carolina and charged with driving while impaired and speeding. He was arrested around 2:30 am and later released on $1,750 bond. According to Charlotte-Mecklenburg police Capt. Lisa Goelz, Chambers faced charges of driving while impaired, speeding and reckless driving. On August 15, it was reported that a lawyer for Chambers said he would plead not guilty to driving while impaired. Chambers was charged despite his blood-alcohol content being below the legal limit, although North Carolina law says he can still be convicted. On September 25, it was reported that Chambers would enter a plea deal in which he would plead guilty to speeding. Under the terms of the plea deal, the charges of driving while impaired and reckless driving were dismissed. He did not have to appear in court. On June 26, general manager Randy Mueller signed a contract extension that is expected to keep him with the team through at least 2010. Mueller will also receive a salary adjustment, however financial details were unavailable. After Nick Saban left following the 2006 season, Mueller's role was altered to give him control of personnel. After the departure of Nick Saban, Dolphins owner H. Wayne Huizenga went on a nationwide search for his next head coach. More than a dozen candidates were interviewed, and on January 19 Cam Cameron agreed to become the seventh head coach in franchise history. Cameron had previously served as offensive coordinator for the San Diego Chargers from 2002 to 2006. He received a four-year contract worth $10 million. Finally, previous offensive coordinator Mike Mularkey was retained, but was reassigned to the role of tight ends coach. Cameron stated he would call the offensive plays himself in 2007. February 14 – Waived wide receiver Chris Davis. February 14 – Waived safety Jack Hunt. February 14 – Waived safety Norman LeJeune. March 1 – Terminated the contract of offensive guard Bennie Anderson. March 1 – Terminated the contract of offensive guard Seth McKinney. March 1 – Waived wide receiver Eric Kimble. March 2 – Terminated the contract of defensive end Kevin Carter. March 2 – Terminated the contract of offensive guard Jeno James. March 3 – Offensive tackle Damion McIntosh signed with the Kansas City Chiefs. March 3 – Running back Sammy Morris signed with the New England Patriots. March 5 – Defensive end Kevin Carter signed with the Tampa Bay Buccaneers. March 5 – Terminated the contract of quarterback Joey Harrington. March 5 – Terminated the contract of tight end Randy McMichael. March 7 – Running back Travis Minor signed with the St. Louis Rams. March 8 – Fullback Darian Barnes signed with the New York Jets. March 8 – Tight end Randy McMichael signed with the St. Louis Rams. March 13 – Defensive tackle Jeff Zgonina signed with the Houston Texans. March 14 – Offensive guard Toniu Fonoti signed with the Atlanta Falcons. March 14 – Offensive guard Seth McKinney signed with the Cleveland Browns. March 19 – Cornerback Eddie Jackson signed with the New England Patriots. March 27 – Defensive end David Bowens signed with the New York Jets. April 9 – Quarterback Joey Harrington signed with the Atlanta Falcons. April 18 – Opted not to match the St. Louis Rams' offer sheet to punter Donnie Jones. May 1 – Waived linebacker Bobby Iwuchukwu. May 1 – Waived wide receiver Marcus Vick. May 1 – Waived defensive tackle Manuel Wright. June 18 – Released defensive tackle Dan Wilkinson. June 28 – Waived defensive tackle Fred Evans. July 6 – Released wide receiver Kelly Campbell. July 17 – Released quarterback Daunte Culpepper. February 21 – Re-signed UFA defensive tackle Vonnie Holliday to a four-year, $20 million contract. March 8 – Re-signed UFA defensive tackle Keith Traylor to a two-year contract. March 19 – Re-signed ERFA fullback Kyle Eckel to a one-year contract. March 19 – Re-signed UFA cornerback Michael Lehan to a one-year contract. March 22 – Re-signed ERFA long snapper John Denney to a one-year contract. April 13 – Re-signed UFA safety Travares Tillman to a one-year contract. April 25 – Re-signed UFA linebacker Donnie Spragan to a one-year contract. May 18 – Re-signed RFA safety Yeremiah Bell to a one-year, $1.3 million contract. May 29 – Re-signed RFA quarterback Cleo Lemon to a one-year, $1.3 million contract. January 2 – Signed placekicker Matt Prater. January 2 – Signed tight end Jason Rader. January 2 – Signed wide receiver P.K. Sam. January 18 – Signed defensive tackle Steve Fifita. January 25 – Signed linebacker Akbar Gbaja-Biamila. January 25 – Signed linebacker Bobby Iwuchukwu. February 6 – Signed quarterback Gibran Hamdan. February 14 – Signed tight end Aaron Halterman. February 19 – Signed punter Ryan Flinn. February 22 – Signed running back Jesse Chatman. March 5 – Signed tight end David Martin (Packers) to a three-year, $3.57 million contract with a $1.2 million signing bonus. March 7 – Signed linebacker Joey Porter (Steelers) to a five-year, $32 million contract with a $12 million signing bonus. March 8 – Signed wide receiver Kelly Campbell. March 8 – Signed placekicker Jay Feely (Giants) to a three-year, $6 million contract. March 8 – Signed safety Cameron Worrell (Bears) to a two-year, $2 million contract with a $285,000 signing bonus. March 15 – Signed fullback Cory Schlesinger (Lions) to a two-year, $2 million contract. March 22 – Signed wide receiver Az-Zahir Hakim (Chargers) to a one-year contract. March 22 – Signed offensive guard Chris Liwienski (Cardinals) to a one-year contract. April 13 – Signed offensive tackle Mike Rosenthal (Vikings) to a one-year, $760,000 contract. April 16 – Signed center Johnathan Ingram. April 16 – Signed running back Ray Perkins. May 15 – Awarded cornerback Derrick Johnson off waivers from the Atlanta Falcons. June 27 – Signed safety Chris Harrell. June 28 – Assigned wide receiver Marvin Allen as their NFL Europa International Practice Squad player. March 5 – Traded wide receiver Wes Welker to the New England Patriots in exchange for second- and seventh-round picks in the 2007 NFL Draft. April 3 – Traded placekicker Olindo Mare to the New Orleans Saints in exchange for a sixth-round pick in the 2007 NFL Draft. June 6 – Traded a conditional fifth-round draft pick in the 2008 NFL Draft to the Kansas City Chiefs in exchange for quarterback Trent Green. For their performances, Mitchel, Dues ,and Vickerson were selected to the 2007 All-NFL Europa team after the season. Meanwhile, Sam led Rhein in receiving with 32 receptions, 529 yards and three touchdowns. Upon the conclusion of the 2007 NFL Europa season, the Dolphins were assigned 24-year-old wide receiver Marvin Allen as their international practice squad player. Allen joined the team for training camp, and will not count toward the team's roster or eight-player practice squad. He also could not be signed by any NFL team during the 2007 season. The Dolphins' last second-round pick (60th overall) was acquired from the New England Patriots in the Wes Welker trade. The team's final pick in the draft (238th overall) was also acquired in the deal. The team's fifth-round pick became property of the Detroit Lions due to the Joey Harrington trade from the previous offseason. The team's second sixth-round pick (199th overall) was acquired from the New Orleans Saints for kicker Olindo Mare. The team's middle seventh-round pick (225th overall) was acquired from the St. Louis Rams when they signed restricted free agent punter Donnie Jones. The Dolphins got a handful of their draft picks signed within a month of the draft, inking four-year deals with running back Lorenzo Booker, punter Brandon Fields, fullback Reagan Mauia, linebacker Kelvin Smith and linebacker Abraham Wright between May 23–25. The Dolphins signed one draft pick in June – defensive tackle Paul Soliai, who also received a four-year deal. Offensive lineman Samson Satele signed for four years on July 18, while quarterback John Beck and center Dew Mormino signed four-year contracts on July 23. At that time, first-round pick Ted Ginn, Jr. was the only unsigned draft pick. However, on the same day that second-round pick Beck was signed, it was reported that the Dolphins and Ginn were close to contract agreement. Unlike the other 15, Hatchett stuck with the team less than two weeks. On May 18, Hatchett was waived upon the signings of Lofton and Malone, as well as the re-signing of restricted free agent Yeremiah Bell. On July 23, the Dolphins signed defensive tackle Brian Soi of Utah State. Soi declared for the NFL's Supplemental Draft in July but went undrafted. The Miami Dolphins entered the 2007 season using the same uniform combinations as they used in 2006. It was announced during the offseason that the Dolphins would make slight alterations to their uniforms. The navy blue outline on the numbers will be thinned in hopes of making them easier to read for viewers. As with many teams that play in warm climates, the Dolphins wear all-white at home and the aqua jersey-white pants scheme only at home night games. While the team still has an all-aqua alternate scheme and an alternate orange jersey, they wore neither in the two years under head coach Nick Saban. Beginning in 2007, the Dolphins' practice jerseys now have last names on the back. In 2007, Miami Dolphins training camp took place at the Dolphins Training Center in Davie, Florida. Rookies reported July 22, and veterans July 27. Training camp ended for veterans and married players on August 24, when they were allowed to check out of the team hotel and return home. Training camp ended for the remaining players on Saturday, August 26. July 28: Activated defensive tackle Brian Soi from the Non-Football Injury list. July 28: Awarded tight end Courtney Anderson off waivers from the Oakland Raiders. July 28: Waived safety David Lofton. July 28: Placed offensive tackle Marion Dukes on the Left Squad list. August 26: Placed offensive tackle Mike Rosenthal on Injured Reserve. The following is the first depth chart released by the Dolphins during training camp, dated August 6. WR 86 Marty Booker 19 Ted Ginn, Jr.
During training camp, Cameron held a battle for the starting quarterback job between Trent Green and Cleo Lemon. Green started the team's first two preseason games and completed 45 percent of his passes for 101 yards with one interception. Lemon was the second quarterback to play in each contest and completed 76 percent of his passes for 108 yards. Nevertheless, Cameron announced that Green would be the team's starting quarterback in 2007. The announcement came on August 20 with two preseason games left to be played. Lemon, who had primarily been no higher than third string in his NFL career, is slated to be the backup to Green in 2007. With NFL rules mandating team rosters must be cut down to 75 players by August 28, the Dolphins released nine players the day before to reach the limit. Those released were: placekicker Matt Prater, punter Ryan Flinn, wide receiver David Sutton, tight end Jason Rader, cornerback Shirdonya Mitchell, safeties Chris Harrell and Christopher Vedder, running back Ray Perkins and cornerback TR Dues. The team made two extra roster moves on the cutdown day. Offensive guard/tackle Joe Toledo was moved to the Reserve/Physically Unable to Perform list, meaning he would be eligible to return Week 7 of the regular season. Free agent linebacker/defensive end Jorge Cordova was added to the roster. Cordova had been released by the Jacksonville Jaguars, with which he had spent the previous three seasons. On September 1, the Dolphins were required to trim the roster to 53 for the regular season. With 22 roster moves needed in all, the Dolphins waived 16 players, waived/injured four and terminated the contracts of two. The Dolphins' roster was not finalized immediately after cuts, however. Three players were claimed off waivers by the Dolphins from other teams, requiring an additional three roster moves. On September 2, wide receiver Kerry Reed and center Johnathan Ingram were waived, while rookie center/guard Drew Mormino was played in season-ending Injured Reserve with a shoulder injury. The Dolphins claimed two players off waivers from the San Diego Chargers – wide receiver Greg Camarillo and offensive tackle Cory Lekkerkerker. Meanwhile, offensive lineman Gene Mruczkowski was claimed off waivers from the New England Patriots. Five days later, defensive end Rob Ninkovich was claimed off waivers from the New Orleans Saints. To make room for him, rookie linebacker Kelvin Smith was waived. Two Dolphins players changed their jersey numbers following the preseason. Long snapper John Denney, who wore No. 97 the first two years of his career, switched to No. 92. Undrafted rookie linebacker Edmond Miles switched from No. 48 to 50 to comply with NFL rules. On September 2 the Dolphins made five additions to their practice squad, all of which among the players cut by the team the day before. Those players were tight end Aaron Halterman, safety Tuff Harris, guard Marquay Love and offensive tackle Julius Wilson and wide receiver Marvin Allen. As the international practice squad player, Allen must remain on the team's practice squad all year and does not count toward the eight-man limit. Two days later, the Dolphins signed three more players – guard Tala Esera, wide receiver Kerry Reed and wide receiver Chandler Williams – to their practice squad. Esera and Reed were with the Dolphins in preseason and released earlier in the month. Chandler, meanwhile, was a seventh-round pick by the Minnesota Vikings in the 2007 NFL Draft out of Florida International University. He was waived by the team during final cuts on September 1. The Dolphins began their 2007 campaign on the road against the Washington Redskins. After a scoreless first quarter, the Redskins made the first move with kicker Shaun Suisham getting a 31-yard field goal three minutes into the second quarter. Miami took the lead before the end of the half with a one-yard touchdown pass from Trent Green to tight end Justin Peelle as time expired. Washington took a 10–7 lead on a 19-yard Clinton Portis touchdown run with just under 12 minutes remaining in the third quarter. Dolphins kicker Jay Feely tied the game at 10 later in the quarter on a 20-yard field goal, and each team notched another field goal in the fourth quarter. With four seconds remaining and the ball on the Washington 43-yard line, Redskins quarterback Jason Campbell launched a last-second Hail Mary pass that was batted by Dolphins defensive end Jason Taylor in the end zone. Redskins wide receiver Antwaan Randle El caught the ball at the six but was tackled at the three-yard line before he could score the winning touchdown. The Redskins won the coin toss to begin overtime and promptly mounted a 10-play, 62-yard drive that included just two passes. Suisham made his third field goal of the game, this time from 39 yards out, to win the game 16–13 and hand Miami their first loss of the season as they started out 0–1 and 0–1 against NFC Opponents. Attempting to rebound from their overtime road loss to the Redskins in Week 1, the Dolphins hosted the Dallas Cowboys in Week 2. In the first quarter, Miami got the first points of the game when kicker Jay Feely converted a 37-yard field goal. The Cowboys responded with a 26-yard field goal by Nick Folk. In the second quarter, Dallas took the lead on a 1-yard Marion Barber III touchdown run. Feely made a 45-yard field goal attempt as the half ended with the Cowboys leading 10–6. In the third quarter, Miami regained the lead with quarterback Trent Green completing an 18-yard TD pass to wide receiver Marty Booker. However, the Cowboys jumped back out in front with quarterback Tony Romo completing a 2-yard touchdown pass to tight end Tony Curtis, which was followed by Folk kicking a 28-yard field goal. In the fourth quarter, Dallas extended the lead with Folk's 47-yard field goal and Romo's 34-yard touchdown pass to wide receiver Terrell Owens. The Dolphins tried to come back as Green completed a 21-yard touchdown pass to wide receiver Derek Hagan, but the Cowboys put the game away with Barber's 40-yard touchdown run as Miami fell to 0–2 and 0–2 against NFC opponents. Trying to snap a two-game skid, the Dolphins flew to The Meadowlands for Week 3 in an AFC East duel against the New York Jets (who were also 0–2 heading into the game). In the first quarter, the Jets flew out first with QB Chad Pennington completing a 3-yard TD pass to WR Laveranues Coles for the only score of the period. In the second quarter, Miami took the lead with RB Ronnie Brown's 1-yard TD run. However, it was short lived as on the ensuing kickoff, RB Leon Washington returned the kick 98 yards for a touchdown. The Dolphins drew closer with kicker Jay Feely's 31-yard and 39-yard field goal. However, New York responded with Pennington completing a 4-yard TD pass to TE Chris Baker. In the third quarter, the Jets increased their lead with kicker Mike Nugent's 21-yard field goal for the only score of the period. In the fourth quarter, New York settled with Pennington getting a 2-yard TD run. Miami nearly had a comeback as Brown got a 2-yard TD run, a 2-point conversion run, and a 22-yard TD pass from QB Trent Green. However, the Jets managed to hold on to win the game. With their third-straight loss, the Dolphins fell to 0–3. Still searching for their first win of the year, the Dolphins went home for a Week 4 duel with the Oakland Raiders, featuring former teammate Daunte Culpepper. The game was delayed for 30 minutes due to thunderstorms in the area. In the first quarter, Miami trailed early as Culpepper completed a 7-yard TD pass to WR Jerry Porter. He even got a 2-yard TD run. In the second quarter, the Dolphins managed to get on the board with RB Ronnie Brown getting a 9-yard TD run for the only score of the period. In the third quarter, the 'Fins managed to get closer with kicker Jay Feely getting a 29-yard field goal, yet Oakland answered with Culpepper getting a 5-yard TD run. Miami ended the period with QB Trent Green completing a 3-yard TD pass to TE Justin Peelle. In the fourth quarter however, Culpepper delivered the final blows by hooking up with Porter again on a 27-yard TD pass and getting a 3-yard TD run. With their fourth-straight loss, the Dolphins fell to 0–4. Still searching for their first win of the year, the Dolphins flew to Reliant Stadium for a Week 5 showdown with the Houston Texans. In the first quarter, Miami's struggles continued with Texans RB Ron Dayne getting a 1-yard TD run. The Dolphins answered with kicker Jay Feely getting a 23-yard field goal. However, with less than 4 minutes to go in the period, history came back to haunt QB Trent Green. During an offensive play, WR Ted Ginn, Jr. was running with the ball and Green went low to block DT Travis Johnson. Trent got hit in the head with Johnson's knee, knocking him unconscious with a concussion. Johnson would then get flagged for taunting the unconscious Trent Green. With Green out of the game, back-up Cleo Lemon came in and helped the Dolphins take the lead with RB Ronnie Brown getting a 3-yard TD run. In the second quarter, Miami increased its lead with Feely getting a 40-yard and a 33-yard field goal. Houston ended the half with kicker Kris Brown getting a 54-yard field goal. In the third quarter, the Dolphins' lead was erased with Brown giving Houston a 43-yard and a 54-yard field goal. In the fourth quarter, Miami reclaimed the lead with Feely kicking a 48-yard field goal. However, the Texans would pull out the win with Brown getting not only a 20-yard field goal, but a gut-punching 57-yard field goal. With their fifth-straight loss, not only did the Dolphins fall to 0–5, but they also suffered their first 8-straight losing streak since 1967. Still looking for their first win of the year, the Dolphins flew to Cleveland Browns Stadium for a Week 6 intraconference duel with the Cleveland Browns. With QB Trent Green still suffering from a concussion from last week, back-up QB Cleo Lemon was given the start. In the first quarter, Miami trailed early as Browns RB Jason Wright got a 1-yard TD run. The 'Fins would respond with kicker Jay Feely getting a 43-yard field goal. However, Cleveland increased its lead with QB Derek Anderson getting a 1-yard TD run. In the second quarter, Miami's struggles continued with Browns kicker Phil Dawson getting a 40-yard field goal, along with Anderson completing a 24-yard TD pass to WR Braylon Edwards. The Dolphins answered with Lemon completing a 14-yard TD pass to TE David Martin, yet Cleveland managed to get a 20-yard field goal from Dawson as time ran out. In the third quarter, the 'Fins started to retaliate with Lemon getting a 5-yard and a 1-yard TD run. Unfortunately, in the fourth quarter, the Browns would pull away with Anderson and Edwards hooking up with each other on a 5-yard and a 16-yard TD pass. Miami's only response would be Lemon's 4-yard TD pass to Martin. With the loss, not only did the Dolphins fall to 0–6 for the first time since 2004, but they also suffered their 9th-straight loss (the worst losing streak in franchise history). Along with the St. Louis Rams, it marked the first time since 2000 (Bengals and Chargers) that two teams began a season at 0–6. Still searching for their first win of the year, the Dolphins returned home for a Week 7 AFC East duel with the undefeated New England Patriots. In the first quarter, Miami's struggles continued as Patriots QB Tom Brady completed a 30-yard TD pass to WR Donté Stallworth and a 2-yard TD pass to TE Kyle Brady. In the second quarter, the Dolphins got their only score of the half with QB Cleo Lemon getting a 4-yard TD run. Afterwards, New England continued its pounding with CB Willie Andrews returning a kickoff 77 yards for a touchdown, along with Brady and WR Randy Moss hooking up with each other on a 35-yard and a 50-yard TD pass. The Patriots would end the half with Brady hooking up with WR Wes Welker on a 14-yard TD pass. After a scoreless third quarter, Miami tried to make a comeback in the fourth quarter. It began with RB Patrick Cobbs getting a 1-yard TD run, along with DE Jason Taylor returning an interception 36 yards for a touchdown. However, New England made sure that they sealed their victory with Brady hooking up with Welker again on a 16-yard TD pass. Afterwards, the 'Fins ended the game with RB Jesse Chatman getting a 7-yard TD run. With the loss, not only did the Dolphins fall to 0–7 for the first time in franchise history, but they also lost RB Ronnie Brown for the year, as he tore his ACL in the third quarter while trying to stop an interception return. Still trying to get their first win, the Dolphins flew to Wembley Stadium for their special international interconference game against the New York Giants. For the game, Miami was listed as the home team. In the first quarter, the Dolphins trailed early as Giants kicker Lawrence Tynes nailed a 20-yard field goal for the only score of the period. In the second quarter, Miami's struggles continued with N.Y. QB Eli Manning getting a 10-yard TD run, along with Tynes nailing a 41-yard field goal. In the third quarter, the 'Fins started to make a comeback as former Giants kicker Jay Feely got a 29-yard field goal for the only score of the period. In the fourth quarter, Miami drew close as QB Cleo Lemon completing a 21-yard TD pass to rookie WR Ted Ginn, Jr. However, New York managed to hold on to their lead for the win. With their 11th-straight loss, the Dolphins entered their bye week at 0–8. Coming off their bye week and still looking for their first win, the Dolphins went home for an AFC East duel with the Buffalo Bills. In the first quarter, Miami struck first as kicker Jay Feely managed to get a 38-yard field goal for the only score of the period. In the third quarter, the Bills got on the board with DE Chris Kelsay sacking QB Cleo Lemon in the endzone for a safety. Fortunately, the 'Fins responded with Lemon getting a 5-yard TD run. Unfortunately, in the fourth quarter, Miami's year-long struggles continued as Buffalo RB Marshawn Lynch got a 3-yard TD run, along with a 2-point conversion run. Later, the Bills sealed the win as kicker Rian Lindell nailed the game-winning 34-yard field goal. With their ninth-straight loss, the Dolphins fell to 0–9, despite outgaining Buffalo in total offensive yards (269 to 214) and time of possession (36:59 to 23:01). This marked the 5th time this year that Miami lost by 3 points. With the Rams' win over the Saints that same week the Dolphins are now the NFL's only winless team. Still searching for their first win, the Dolphins flew to Lincoln Financial Field for a Week 11 interconference duel with the Philadelphia Eagles. This game would mark the NFL debut of rookie QB John Beck. After a scoreless first quarter, Miami got the first splash as rookie WR/KR/PR Ted Ginn, Jr. returned a punt 87 yards for a touchdown (the first TD punt return for the Dolphins since 2000). The Eagles would end the half with kicker David Akers nailing a 34-yard field goal. In the third quarter, Miami's year-long struggles continued as Philadelphia took the lead with RB Correll Buckhalter getting an 8-yard TD run for the only score of the period. In the fourth quarter, the Eagles sealed the win with QB A. J. Feeley (a former Dolphin) completing a 4-yard TD pass to WR Jason Avant. With the loss, the Dolphins fell to 0–10, eliminating them from playoff contention. This would be the first time since the 2001 Detroit Lions (who began their year at 0–12) that a team began a season 0–10. Still trying to get their first win of the year, the Dolphins flew to Heinz Field for a Week 12 Monday Night intraconference duel with the Pittsburgh Steelers. For LB Joey Porter, it would be his first game in Pittsburgh against his former team. This would also mark the NFL return of RB Ricky Williams. Playing in heavy rain with a delay due to lightning, the game (also known as the Heinz Field Fiasco) remained scoreless through over 59 minutes, becoming the longest scoreless tie since 1943. The game would end with Miami falling yet again as Steelers kicker Jeff Reed got the only points of the game on a fourth-quarter 24-yard field goal with 0:17 left. With the loss, not only did the Dolphins fall to 0–11, but this would also mark the sixth time this season that the Dolphins lost by 3 points or less (a franchise worst). In his first NFL game since New Year's Day of 2006, reinstated running back Ricky Williams had only six carries for 15 yards. He left the game in the second quarter with a torn pectoral muscle after fumbling and being stepped on by Lawrence Timmons. Williams would later be placed on the injured reserve list, ending his season. Still trying to get their first win of the year, the Dolphins went home for a Week 13 AFC East rematch with the throwback-clad New York Jets. In the first quarter, Miami trailed early as Jets RB Leon Washington got an 18-yard TD run. The Dolphins ended the period with kicker Jay Feely getting a 53-yard field goal. In the second quarter, Miami drew closer as Feely kicked a 44-yard field goal, yet New York replied with kicker Mike Nugent getting a 29-yard field goal. Afterwards, the Dolphins took the lead as CB Michael Lehan returned a fumble 43 yards for a touchdown. However, the Jets regained the lead with QB Kellen Clemens completing a 19-yard TD pass to WR Brad Smith, along with Nugent kicking a 40-yarder and a 35-yard field goal. In the third quarter, New York increased their lead with Nugent kicking a 35-yard field goal for the only score of the period. In the fourth quarter, the Jets sealed the win with RB Thomas Jones getting a 1-yard TD run, Nugent nailing a 26-yard field goal, and Washington getting a 12-yard TD run. With the loss, Miami fell to 0–12, and have lost 15 straight games dating back to game 14 of last season. This also marked the first time since the 2001 Detroit Lions that a team began a season 0–12. Still trying to get their first win, the Dolphins flew to Ralph Wilson Stadium for a Week 14 AFC East rematch with the Buffalo Bills. In the first quarter, Miami's year-long struggles continued as Bills QB Trent Edwards completed a 13-yard and a 28-yard TD pass to TE Robert Royal, while rookie QB John Beck had the ball slip out of his hand and have it caught by Buffalo Safety George Wilson, who would return it 20 yards for a touchdown. The Dolphins would get on the board with RB Samkon Gado getting a 12-yard TD run, yet the Bills answered with kicker Rian Lindell getting a 51-yard field goal. In the second quarter, Buffalo continued its dominance as Edwards completed a 9-yard TD pass to WR Lee Evans for the only score of the period. In the third quarter, the 'Fins tried to rally as Gado got a 20-yard TD run, while kicker Jay Feely got a 41-yard field goal. However, in the fourth quarter, the Bills sealed the win with Edwards and Evans hooking up with each other again on a 70-yard TD pass. With yet another loss, the Dolphins fell to 0–13. This would mark their 16th-straight loss, dating back to last season. Also, Miami became the 5th team in NFL history to begin a season at 0–13. Despite getting the start, Beck only lasted for the first three series, due to a dismal performance (1/2 for 6 yards). Still in the hunt for their first win of the year, the Dolphins went home for a Week 15 intraconference duel with the Baltimore Ravens. In the first quarter, Miami trailed early as Ravens kicker Matt Stover managed to get a 27-yard field goal for the only score of the period. In the second quarter, the Dolphins continued to trail as Stover kicked a 39-yard field goal. Afterwards, the 'Fins got on the board as kicker Jay Feely managed to get a 23-yard field goal. Baltimore would end the half with QB Kyle Boller completing a 17-yard TD pass to WR Derrick Mason. In the third quarter, Miami began to gain steam as RB Samkon Gado managed to get a 7-yard TD run for the only score of the period. In the fourth quarter, the Dolphins took the lead as Feely kicked a 29-yard and an 18-yard field goal. Afterwards, the Ravens tied the game with Stover nailing an 18-yard field goal. In overtime, the Dolphins nearly lost again as Stover missed a potential game winning 44 yard field goal. However, the demons were lifted as QB Cleo Lemon completed the game-winning 64-yard TD pass to WR Greg Camarillo. Soon after players and coaches rejoiced in the locker room after a long-awaited first win. With the win, not only did Miami improve to 1–13, but it also snapped a 16-game losing streak dating back to last season's December 10 win over the New England Patriots, notching their first win of the 2007 season and avoiding their becoming the first team in NFL history to go 0–16. This was their only win in a 1–15 and would keep them from being possibly labeled as the worst team in NFL history. They also avoided having to play with a 0–14 record against a New England Patriots team carrying the complementary 14–0 record, and widely rooted for to become the first team in over 30 years to match the perfect season feat originally posted by the Dolphins. Cleo Lemon got his first career 300-yard game, as he completed 23 out of 39 passes for 315 yards and 1 touchdown. Coming off their home win over the Ravens, the Dolphins flew to Gillette Stadium for a Week 16 AFC East rematch with the undefeated New England Patriots. In the first quarter, Miami trailed early as Patriots QB Tom Brady completed an 11-yard TD pass to WR Randy Moss for the only score of the period. In the second quarter, New England pulled away with Brady & Moss hooked up with each other again on a 1-yard TD pass, RB Laurence Maroney getting a 59-yard TD run, and Brady completing a 48-yard TD pass to WR Jabar Gaffney. In the third quarter, the Dolphins would get on the board as QB Cleo Lemon completed a 21-yard TD pass to WR Greg Camarillo. However, the Patriots' defense took over for the rest of the game. With the loss, Miami fell to 1–14. Hoping to finish their horrendous season on a high note, the Dolphins went home for a Week 17 intraconference duel with the Cincinnati Bengals. In the first quarter, Miami struck first as kicker Jay Feeley managed to get a 49-yard field goal. The Bengals would take the lead as QB Carson Palmer completed a 2-yard TD pass to WR Chad Johnson. In the second quarter, the 'Fins regained the lead as QB Cleo Lemon completed a 5-yard TD to rookie WR Ted Ginn, Jr., yet Cincinnati retook the lead with Palmer completing a 70-yard TD pass to Chad Johnson and a 4-yard TD pass to WR Antonio Chatman. In the third quarter, the Bengals increased their lead with Safety Chinedum Ndukwe returning a fumble 54 yards for a touchdown. In the fourth quarter, the Dolphins tried to come back as rookie QB John Beck got a 2-yard TD run, but Cincinnati pulled away as RB Kenny Watson got a 2-yard TD run and kicker Shayne Graham nailing a 30-yard field goal. Miami ended the game with Beck completing a 22-yard TD pass to WR Derek Hagan. With the loss, the Dolphins ended their season at 1–15 and became the 8th team to end a season at 1–15 after the 2001 Panthers. During the Dolphins' Week 1 loss to the Redskins, starting strong safety Yeremiah Bell suffered a torn Achilles' tendon. As a result, he was placed on season-ending Injured Reserve on September 11. The team also waived backup defensive end Akbar Gbaja-Biamila, who did not play in the season opener. With two open spots on the 53-man roster, the team signed contracts with veteran safeties and Donovin Darius and Lamont Thompson. They were waived by the Oakland Raiders and Tennessee Titans, respectively, at the end of the preseason. The same day, rookie linebacker Kelvin Smith, who was waived four days earlier, was re-signed to the team's practice squad. On the first day of the month, linebacker Robert McCune was waived from injured reserve. Linebacker Jim Maxwell suffered the same fate eight days later. The Dolphins' active roster remained unchanged for nearly a month after the season opener. The first transactions since came on October 10, when defensive tackle Sam Rayburn was signed and safety Lamont Thompson was released. Thompson appeared in one game for the Dolphins after being signed on September 11 and made one tackle. Rayburn went to training camp with the San Francisco 49ers in 2007 after spending the first four years of his career with the Philadelphia Eagles. On October 16, Miami traded their No. 1 receiver, seven-year veteran Chris Chambers, to the San Diego Chargers in exchange for a second-round pick in the 2008 NFL Draft. In 100 games with the Dolphins since being drafted in the second round of the 2001 NFL Draft, Chambers caught 405 passes for 5,688 yards and 43 touchdowns. He earned his first Pro Bowl selection in 2005. In the team's first six games of the 2007 season, he caught 31 passes for 415 yards with no touchdowns. On the same day, the team also released safety Donovin Darius and placed defensive tackle Chase Page on injured reserve. To fill the three roster spots vacated by Chambers, Darius and Page, the Dolphins signed three defensive linemen – tackles Anthony Bryant and Jesse Mahelona and end Derreck Robinson. Bryant was on the practice squad of the Baltimore Ravens prior to his signing. Mahelona and Robinson had been released by the Tennessee Titans and San Diego Chargers, respectively, in September. After suffering a concussion in the team's Week 5 game against the Houston Texans, starting quarterback Trent Green was placed on injured reserve on October 20. Wide receiver Kerry Reed – an undrafted free agent from Michigan State – was promoted to the active roster from the practice squad. Three days later, defensive tackle Jesse Mahelona was waived after being inactive for one game with the team. Starting running back Ronnie Brown and starting free safety Renaldo Hill were both placed on injured reserve with torn ACLs suffered in the team's Week 7 game against the New England Patriots. Brown was leading the NFL in offensive yards at the time of the injury. On October 24, two of the three roster spots were filled from outside the organization as the Dolphins signed defensive end Quentin Moses and safety Lance Schulters. Moses was originally drafted by the Oakland Raiders in the third round of the 2007 NFL Draft and was claimed off waivers by the Arizona Cardinals on September 2. He was inactive for six games before being waived. Schulters spent the latter part of the 2006 season with the Atlanta Falcons after starting for the Dolphins in 2005. Tight end Aaron Halterman was also promoted from the practice squad. Additionally, running back Samkon Gado was claimed off waivers from the Houston Texans. The team was granted a one-game roster exemption, as Gado was unable to meet the Dolphins in time for their October 28 game in London. On October 30, defensive tackle Sam Rayburn was waived to make room for Gado on the active roster. The Dolphins also filled two practice squad spots vacated by Reed and Halterman with quarterback Casey Bramlet and tight end Buck Ortega. A seventh-round pick by the Cincinnati Bengals in 2004, Bramlet spent 2007 training camp with the Atlanta Falcons. Ortega had been waived by the Cleveland Browns in late August. On November 6, the Dolphins placed linebacker Abraham Wright – one of the team's seventh-round picks in 2007 – on injured reserve with a knee injury. He had inactive for all eight of the team's games in 2007. Practice squad tight end Buck Ortega was released the same day. The following day, defensive back Jereme Perry was signed to the active roster an undrafted free agent wide receiver Stefan Logan (South Dakota) was signed to the practice squad. Perry had spent the 2006 season and 2007 training camp with the Cleveland Browns. On November 14, safety Travares Tillman was placed on injured reserve with a knee injury. Tuff Harris – an undrafted defensive back from Montana – was promoted from the practice squad to the active roster. Placekicker Matt Prater, who spent training camp with the Dolphins, was re-signed to the practice squad. Prater briefly held the kicking job for the Atlanta Falcons, but was waived on September 19 after going 1-for-4 on field goal in two games. On November 19, running back Ricky Williams was reinstated by the NFL. Williams had been suspended since the 2006 offseason for his fourth violation of the league substance abuse policy. The team was granted a one-week roster exemption for Williams. Williams' return to the Dolphins did not last long, however. After being activated by the Dolphins when running back Samkon Gado was waived on November 26, Williams suffered a torn pectoral muscle against the Pittsburgh Steelers. He was placed on injured reserve on November 28 and Gado was re-signed. Despite returning to practice on November 6, offensive lineman Joe Toledo – on the physically-unable-to-perform list since training camp – was unable to return to the active roster for the 2007 season. His practice period expired on November 27, forcing him to remain on the PUP list for the remainder of the season. On December 4, starting middle linebacker Zach Thomas was placed on injured reserve with lingering effects of a concussion suffered earlier in the season. Safety Cameron Worrell became the third starting strong safety to be placed on injured reserve after suffering a torn ACL in the team's Week 13 game against the New York Jets. Wide receiver Kerry Reed was also waived by the team after spending six games on the active roster. To fill two of the roster spots, linebacker Kelvin Smith and offensive tackle Julius Wilson were promoted to the active roster from the practice squad. Both rookies, Smith had originally been drafted in the seventh round out of Syracuse in 2007 while Wilson was signed as an undrafted free agent out of UAB. Filling the third spot was rookie linebacker Mark Washington, who was signed off the practice squad of the San Francisco 49ers. Wide receiver Kerry Reed was re-signed to the practice squad after being waived by the team, and linebacker Marcello Church was signed to the practice squad as well. Church went undrafted out of Florida State in 2006 and had spent part of the 2007 offseason with the Pittsburgh Steelers. Dolphins players received two weekly honors during the 2007 season. Wide receiver Ted Ginn, Jr. won Diet Pepsi NFL Rookie of the Week honors for his performance against the Philadelphia Eagles in Week 11, during which he returned a punt 87 yard for a touchdown (the first of his career) and also caught four passes for 52 yards. In Week 15, quarterback Cleo Lemon won AFC Offensive Player of the Week honors for leading the Dolphins to their first victory of the season against the Baltimore Ravens. In the game, Lemon went 23-for-39 for 315 yards and threw a game-winning 64-yard touchdown pass to Greg Camarillo in overtime. On December 18, it was announced that defensive end Jason Taylor was selected to the 2008 Pro Bowl – his fourth straight selection and sixth overall. Taylor finished the 2007 season with 56 tackles (47 solo), 11 sacks, four passes defensed and an interception returned for a touchdown. ^ "Miami Dolphins History". NFL-History.com. Archived from the original on July 2, 2007. Retrieved June 24, 2007. ^ "Miami Dolphins 2006 Schedule". NFL. Archived from the original on May 22, 2007. Retrieved June 24, 2007. ^ Maske, Mark (May 26, 2006). "Saban, Dolphins Set Sights on Overtaking Pats". The Washington Post. Retrieved June 24, 2007. ^ a b c "After repeated denials, Saban takes Bama job". ESPN. Retrieved June 15, 2007. ^ "Dolphins Will Host Giants In London On October 28". MiamiDolphins.com. Archived from the original on September 29, 2007. Retrieved June 15, 2007. ^ "Half A Million Ticket Requests In 72-Hour Span". MiamiDolphins.com. Archived from the original on September 29, 2007. Retrieved June 15, 2007. ^ "40,000 Tickets For London Game Sell In 90 Minutes". MiamiDolphins.com. Archived from the original on July 4, 2007. Retrieved June 15, 2007. ^ "Broncos give up draft pick to get Wilkinson from Fins". ESPN. Retrieved June 24, 2007. ^ "Wilkinson trade could be in jeopardy". ESPN. Retrieved June 24, 2007. ^ "Dolphins, Broncos extend deadline on 'Big Daddy'". ESPN. Retrieved June 24, 2007. ^ a b "Wilkinson trade voided, Dolphins retain rights". ESPN. Retrieved June 24, 2007. ^ a b "After failing to trade him, Dolphins cut Wilkinson". ESPN. Retrieved June 24, 2007. ^ a b c "Dolphins' DT Evans arrested, charged with battery". Sun-Sentinel.com. Archived from the original on June 27, 2007. Retrieved June 24, 2007. ^ "Statement From Miami Dolphins Head Coach Cam Cameron On Fred Evans". MiamiDolphins.com. Archived from the original on September 26, 2007. Retrieved June 24, 2007. ^ a b "Dolphins waive Fred Evans". Sun-Sentinel.com. Archived from the original on July 1, 2007. Retrieved June 28, 2007. ^ "Dolphins Release Kelly Campbell". MiamiDolphins.com. Archived from the original on July 13, 2007. Retrieved July 24, 2007. ^ a b c "Dolphins wide receiver Chambers charged in N.C." ESPN. Retrieved July 14, 2007. ^ a b "Chambers to plead not guilty to D.W.I." NFL. Retrieved August 15, 2007. ^ a b c "Chambers won't face DWI, reckless driving charges after plea". ESPN. Retrieved September 25, 2007. ^ a b c d "Dolphins, Cameron strike four-year deal". ESPN. Retrieved June 15, 2007. ^ "It's official: Tomlin is Steelers' new coach". FoxSports.com. Archived from the original on January 23, 2007. Retrieved June 15, 2007. ^ "Dolphins Release Williams From Coaching Staff". MiamiDolphins.com. Archived from the original on September 26, 2007. Retrieved June 15, 2007. ^ Cannizzaro, Mark (February 7, 2007). "Quinn Takes Jets Job". New York Post. Archived from the original on April 1, 2007. Retrieved June 15, 2007. ^ Fialkov, Harvey (January 22, 2007). "Cameron Cleans House Sources: Hill, Baggett Among Those Fired". Sun-Sentinel.com. Retrieved June 15, 2007. ^ a b c "Dolphins Add Robiskie, Maxie To Coaching Staff; Capers, Armstrong Sign Contract Extensions". MiamiDolphins.com. Archived from the original on September 26, 2007. Retrieved June 24, 2007. ^ "Travis Jones, AC, Miami Dolphins". KFFL.com. Retrieved June 24, 2007. ^ "Dolphins to pay Capers; new head coach next?". ESPN. Retrieved June 24, 2007. ^ a b c "Dolphins Sign Cory Schlesinger As A UFA; 2007 Coaching Staff Completed". MiamiDolphins.com. Archived from the original on September 29, 2007. Retrieved June 24, 2007. ^ "Dolphins Add Hoffman To Coaching Staff". MiamiDolphins.com. Archived from the original on September 29, 2007. Retrieved June 24, 2007. ^ "Dolphins Name Bobby Jackson Running Backs Coach". MiamiDolphins.com. Archived from the original on September 26, 2007. Retrieved June 24, 2007. ^ a b "Dolphins Add Marshall To Coaching Staff, Sign Chatman". MiamiDolphins.com. Archived from the original on September 26, 2007. Retrieved June 24, 2007. ^ a b c "Dolphins Add Shea, Ohrt To Coaching Staff; Sign Punter". MiamiDolphins.com. Archived from the original on September 26, 2007. Retrieved June 24, 2007. ^ a b "Dolphins Add Reynolds, Schiotz To Coaching Staff". MiamiDolphins.com. Archived from the original on September 26, 2007. Retrieved June 24, 2007. ^ "Coaches Spotlight – Cam Cameron, Miami Dolphins". NFLHS.com. Archived from the original on September 27, 2007. Retrieved June 24, 2007. ^ a b c d "Dolphins Sign Free Agent Tight end; Release Three". MiamiDolphins.com. Archived from the original on September 26, 2007. Retrieved June 24, 2007. ^ a b c "Dolphins Release Three Players; Mini-Camp Dates Announced". MiamiDolphins.com. Archived from the original on September 29, 2007. Retrieved June 24, 2007. ^ a b "Dolphins Tender Six Free Agents; Release Carter, James". MiamiDolphins.com. Archived from the original on September 29, 2007. Retrieved June 24, 2007. ^ a b "Chiefs Agree to Terms of a Six-Year Contract with UFA T Damion McIntosh". KCChiefs.com. Archived from the original on March 14, 2007. Retrieved June 24, 2007. ^ a b "Adalius Thomas, Kyle Brady and Sammy Morris signed". Patriots.com. Archived from the original on September 29, 2007. Retrieved June 24, 2007. ^ "Bucs Pump Up Pass Rush with Carter". Buccaneers.com. Retrieved June 24, 2007. ^ a b c d e f "Dolphins Sign David Martin As UFA; Trade Welker For Two Picks; Release McMichael And Harrington". MiamiDolphins.com. Archived from the original on September 29, 2007. Retrieved June 24, 2007. ^ a b "Rams Sign Steussie, Make Other Moves". StLouisRams.com. Archived from the original on March 17, 2007. Retrieved June 24, 2007. ^ a b "FB Barnes Added to the Backfield". NewYorkJets.com. Archived from the original on March 29, 2007. Retrieved June 24, 2007. ^ "Rams Agree to Terms with TE McMichael, S Johnson". StLouisRams.com. Archived from the original on June 3, 2007. Retrieved June 24, 2007. ^ a b "Veteran DT Zgonina signs with Texans". ESPN. Retrieved June 24, 2007. ^ a b "Falcons add G Fonoti, WR Hamilton". AtlantaFalcons.com. Archived from the original on March 26, 2007. Retrieved June 24, 2007. ^ "After sitting out 2006, McKinney goes to Browns". ESPN. Retrieved June 24, 2007. ^ a b "Patriots sign free agent CB Eddie Jackson". Patriots.com. Archived from the original on September 29, 2007. Retrieved June 24, 2007. ^ a b "Bowens is fourth DE added by Jets in offseason". ESPN. Retrieved June 24, 2007. ^ "Former No. 1 pick Harrington agrees to Falcons deal". ESPN. Retrieved June 24, 2007. ^ a b c "Dolphins Opt Not To Match Rams' Offer Sheet For Donnie Jones". MiamiDolphins.com. Archived from the original on September 26, 2007. Retrieved June 24, 2007. ^ a b c "Dolphins Release Three Players". MiamiDolphins.com. Archived from the original on September 29, 2007. Retrieved June 24, 2007. ^ "Dolphins release Kelly Campbell". MiamiDolphins.com. Archived from the original on July 13, 2007. Retrieved July 6, 2007. ^ "Dolphins release Daunte Culpepper". MiamiDolphins.com. Archived from the original on September 5, 2007. Retrieved July 18, 2007. ^ a b "Dolphins, Holliday agree on four-year contract". ESPN. Retrieved June 24, 2007. ^ a b c "Dolphins Re-Sign Traylor; Sign UFAs Feely And Worrell; Sign FA Campbell; Host A Pair Of UFAs". MiamiDolphins.com. Archived from the original on September 26, 2007. Retrieved June 24, 2007. ^ a b "Dolphins Re-Sign DT Kevin Vickerson". MiamiDolphins.com. Archived from the original on September 29, 2007. Retrieved June 24, 2007. ^ a b "Dolphins cut ties with G James, DT Vickerson". Sun-Sentinel.com. Archived from the original on September 30, 2007. Retrieved June 24, 2007. ^ a b c d "Dolphins Re-Sign Eckel, Lehan". MiamiDolphins.com. Archived from the original on September 29, 2007. Retrieved June 24, 2007. ^ a b c d "Dolphins Sign Hakim And Liwienski As UFAs; Re-Sign Denney". MiamiDolphins.com. Archived from the original on September 29, 2007. Retrieved June 24, 2007. ^ a b c "Dolphins Open First Mini-Camp Under Cameron; Re-Sign Tillman, Sign Free Agent OT Rosenthal". MiamiDolphins.com. Archived from the original on September 26, 2007. Retrieved June 24, 2007. ^ a b "Dolphins Re-Sign LB Donnie Spragan". MiamiDolphins.com. Archived from the original on September 29, 2007. Retrieved June 24, 2007. ^ a b "Bell unable to land long-term deal". Sun-Sentinel.com. Archived from the original on June 23, 2007. Retrieved June 24, 2007. ^ a b "Lemon signs $1.3 million qualifying offer with Dolphins". ESPN. Retrieved June 24, 2007. ^ a b c d e f g "Dolphins Sign Seven For 2007". MiamiDolphins.com. Archived from the original on September 26, 2007. Retrieved June 24, 2007. ^ Bouchette, Ed (March 7, 2007). "Porter, Dolphins reach agreement". Post-Gazette.com. Archived from the original on June 13, 2007. Retrieved June 24, 2007. ^ "Feely, Dolphins agree to three-year deal". ESPN. Retrieved June 24, 2007. ^ "Todd, Worrell leave Bears". Chicago Sun-Times. Archived from the original on March 20, 2007. Retrieved June 24, 2007. ^ "Schlesinger agrees to deal with Dolphins". ESPN. Retrieved June 24, 2007. ^ "Dolphins add veteran OT Rosenthal". ESPN. Retrieved June 24, 2007. ^ a b "Dolphins Sign RB Ray Perkins And C Johnathan Ingram". MiamiDolphins.com. Archived from the original on September 29, 2007. Retrieved June 24, 2007. ^ "Dolphins Awarded CB Derrick Johnson Off Waivers". MiamiDolphins.com. Archived from the original on June 25, 2007. Retrieved June 24, 2007. ^ "Dolphins Sign Randy Mueller To Contract Extension; Sign Free Agent Safety Harrell". MiamiDolphins.com. Archived from the original on September 29, 2007. Retrieved June 28, 2007. ^ a b c d "Dolphins Assigned International Player; Waive Fred Evans". MiamiDolphins.com. Archived from the original on July 7, 2007. Retrieved June 28, 2007. ^ a b "Dolphins Acquire Saints Sixth-Round Pick For Olindo Mare". MiamiDolphins.com. Archived from the original on September 26, 2007. Retrieved June 24, 2007. ^ "Dolphins Acquire Trent Green From Kansas City". MiamiDolphins.com. Archived from the original on June 8, 2007. Retrieved June 24, 2007. ^ "Ex-Bear Matthews behind new league". Chicago Tribune. Retrieved July 3, 2007. ^ "NFL Assignments to NFL Europa League". NFLEurope.com. Archived from the original on June 13, 2007. Retrieved June 24, 2007. ^ "Vickerson, Mitchell Named First-Team All-NFL Europa". MiamiDolphins.com. Archived from the original on September 29, 2007. Retrieved June 24, 2007. ^ "Two Dolphins named All-NFL Europa". Sun-Sentinel.com. Archived from the original on June 28, 2007. Retrieved June 25, 2007. ^ "Miami Dolphins 2007 Picks". ESPN. Archived from the original on June 25, 2007. Retrieved June 24, 2007. ^ "Some fishy moves at quarterback". NFL. Archived from the original on June 16, 2007. Retrieved June 24, 2007. ^ "Dolphins Open Mini-Camp II; Team Signs Fourteen College Free Agents". MiamiDolphins.com. Archived from the original on September 29, 2007. Retrieved June 24, 2007. ^ "Dolphins Sign Two College Free Agents". MiamiDolphins.com. Archived from the original on June 25, 2007. Retrieved June 24, 2007. ^ "Culpepper Practices On Limited Basis In Team's OCS Session; Dolphins Waive Hatchett". MiamiDolphins.com. Archived from the original on June 25, 2007. Retrieved June 24, 2007. ^ "Dolphins Sign Draft Choices Beck, Mormino; Add Free Agent Soi". MiamiDolphins.com. Archived from the original on September 29, 2007. Retrieved July 23, 2007. ^ "2007 NFL Supplemental Draft". NFLDraftCountdown.com. Archived from the original on July 11, 2007. Retrieved July 23, 2007. ^ "Oliver, Gaither selected in supplemental draft". NFL. Archived from the original on July 14, 2007. Retrieved July 23, 2007. ^ "Uniform will be altered". MiamiHerald.com. Archived from the original on July 10, 2007. Retrieved July 3, 2007. ^ "Minicamp stuff". Sun-Sentinel.com. Archived from the original on September 28, 2007. Retrieved July 3, 2007. ^ "Saban shows sense of humor". Sun-Sentinel.com. Archived from the original on September 29, 2007. Retrieved July 3, 2007. ^ "Minicamp stuff". Sun-Sentinel.com. Archived from the original on September 12, 2007. Retrieved July 3, 2007. ^ "NFL Releases Dates, Locations For 2007 Team Training Camps". NFLPlayers.com. Retrieved June 28, 2007. ^ a b "Born To Run; Other Training Camp Notes". MiamiDolphins.com. Archived from the original on September 26, 2007. Retrieved August 26, 2007. ^ "8/6 afternoon session update – First depth chart released". PalmBeachPost.com. Retrieved August 7, 2007.